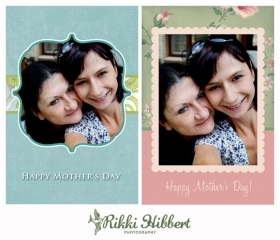 FREE Mothers Day Card Templates from I Heart Faces! It’s Mothers Day just around the corner on 8 May 2011. Show your Mom how much you love and appreciate her, by making her a special card she will cherish forever. The ladies at I Heart Faces have created three high-resolution printable card templates for you to download and customize with your favourite photo. Download the template here, and follow the step-by-step instructions for Photoshop and Photoshop Elements. You’re the best daughter in the whole wide world! And you’re the bestest Mom in the whole wide world!